Motorists heading around Glenwood Canyon must endure a long detour via state Highway 13 at Rifle to U.S. 40 from Craig to Steamboat Springs and Highway 131 back to I-70 at Wolcott. Travelers headed to and from the southeastern part of the state are advised to take U.S. 50. More than a dozen car-sized boulders fell Monday at the same location as a smaller slide that closed I-70 in both directions earlier in the day. 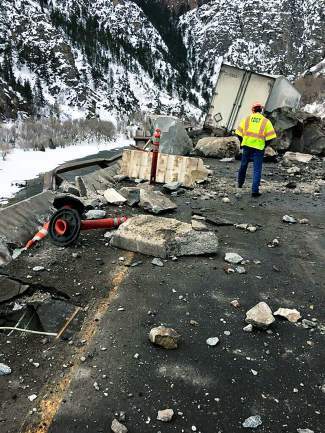 GLENWOOD SPRINGS — A massive rock slide that toppled onto Interstate 70 in Glenwood Canyon late Monday will result in a lengthy detour until at least Thursday afternoon. That’s the earliest Colorado Department of Transportation officials expect to be able to open a single lane of alternating traffic led by a pilot car, department spokeswoman Tracy Trulove said. And that depends on the success of rock scaling operations to make sure the canyon walls are stable, she said. A helicopter was used on Tuesday to allow its geohazards team view the damage from above, and engineers inspected the road for structural damage. 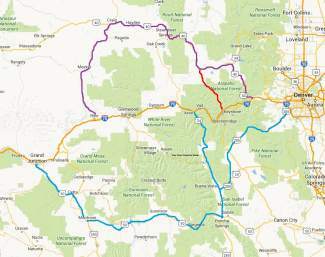 In the meantime, motorists heading around the canyon must endure a 146-mile detour via state Highway 13 at Rifle to U.S. Highway 40 from Craig to Steamboat Springs and Highway 131 back to I-70 at Wolcott. Travelers headed to and from the southeastern part of the state are advised to take U.S. Highway 50. The second rock slide of the day Monday happened just after 9 p.m. about three-quarters of a mile west of the Hanging Lake Tunnels and 8 miles east of Glenwood Springs. The slide involving more than a dozen car-sized boulders originated from high on the canyon wall was in the same location as a smaller one that closed I-70 in both directions for about two hours early Monday morning. After the earlier incident, crews determined it was safe to reopen one lane in both directions around 5 a.m. while the rocks were being removed throughout the day. During the second slide, two westbound semis and at least one car were passing by at the time, and one of the semis was severely damaged by the falling boulders. No one was injured. 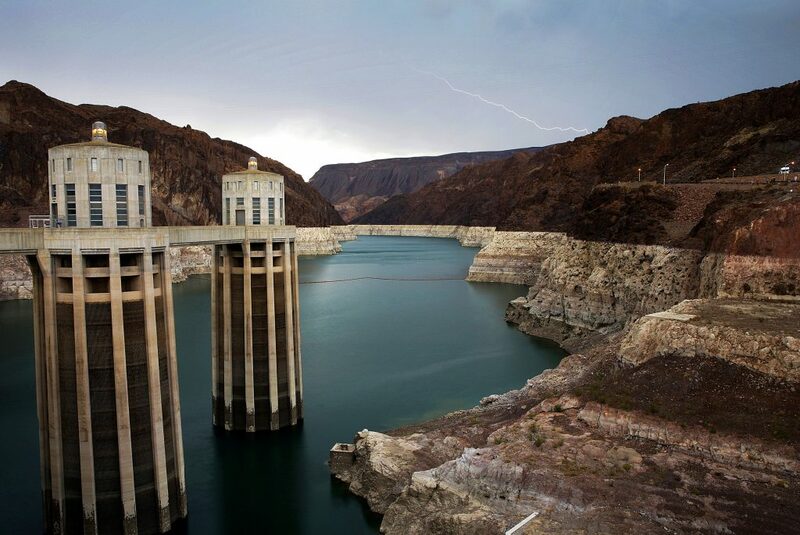 Several boulders crashed onto the eastbound lanes, while others tumbled all the way across the Colorado River. I-70 was fully closed shortly after 10 p.m. Monday, stranding dozens of motorists who had to be turned around toward either Eagle or Glenwood Springs. 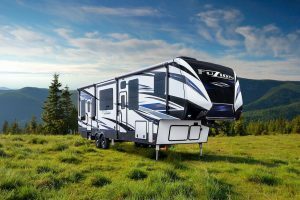 Among those coming through the canyon to Glenwood Springs was Ron Milhorn, news and sports director for KMTS radio, who was headed home with his family after seeing his newborn granddaughter in Denver. 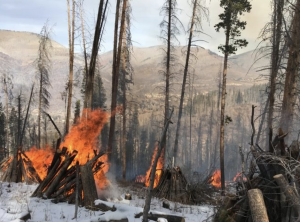 “We could see that the eastbound lanes were closed, and when we got out of the tunnel things just came to a stop,” he said from the Eagle Diner Tuesday afternoon before making the trek up and over through Steamboat Springs and Craig. Eventually able to turn around and find a safe spot to pull over, Milhorn said he walked up to take a look at the carnage and happened onto the truck driver who came away unscathed. CDOT’s regional transit Bustang, which ordinarily runs from Glenwood to Denver and back each day, picked up only as far west as Vail on Tuesday morning. Eagle will be its westernmost point until I-70 is reopened, the bus service’s Twitter feed said Tuesday. The westbound return bus Monday evening stopped at Vail for the night and took the route through Meeker and Rifle to bring passengers back to Glenwood. Glenwood resident Nick Isenberg was on the bus and said the 14 westbound passengers spent Monday night at the Vail Interfaith Chapel. Vail police made a grocery run to buy milk for a toddler who was among the passengers, Isenberg said, and the department of transportation provided riders with breakfast from McDonald’s. Trulove said it will take some time to determine the extent of the damage from the slide and the costs to repair it, but several weeks of construction should be anticipated. Once the single lane is opened, a pilot car could be in place for several days while the initial repairs and additional rock stabilization are completed, she said. Rockfall contractors are already lined up to continue the rock scaling work, and as a safety precaution a rockfall mitigation fence will be erected on the westbound lanes. The 12-mile stretch of I-70 through Glenwood Canyon, in particular the section just west of the Hanging Lake Tunnels, has had numerous major rock slides that have resulted in highway closures over the years. In February 1995, three people were killed when a large rock tumbled onto the roadway, crushing their vehicle. One of the largest rockslides to occur was on Thanksgiving Day 2004, when I-70 through the canyon was closed for more than a day during the height of holiday traffic. Several Glenwood Springs businesses reported a surplus of customers Tuesday morning as people had begun making their way toward eastbound I-70 only to realize it was closed. The Ramada Inn reported an unusually high number of guests Monday night as motorists were stranded and didn’t want to make the nighttime drive over the winding, two-lane detour route.